A complete line of trucks for waste collection, material transport, and laundry handling. Rotational Molding technology makes these trucks strong and durable. 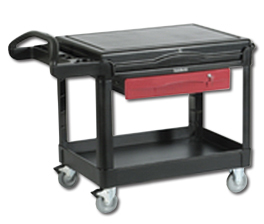 Standard Duty models are designed to support USDA Meat and Poultry Equipment Compliance. Assists in complying with HACCP guidelines. Diamond caster pattern provides superior maneuverability. Optional hinged domed lids are available. Trucks and lids are Black in color. FOB Shipping Point. Product No. Description Wt. Price Ea.